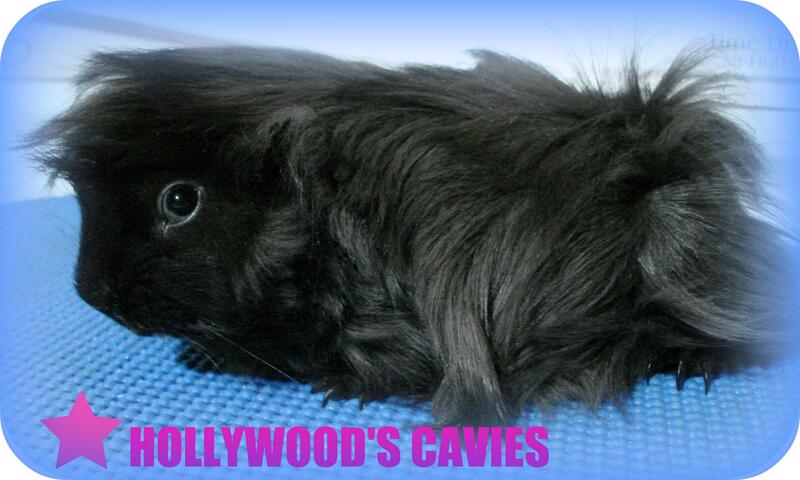 stars light up your life"
Welcome to Hollywood's Cavies. Small homebased caviay where I strive to breed healthy and beautiful good natured cavies - most people know them as guinea pigs. The breeds I work with and own are Peruvians and Cresteds with the occasional smooth coat. All my cavies are kept in my home where I can control temperature, cleanliness, and provide them with all the attention and tender loving care they deserve. HEAD, EYES and EARS: Head to be short and broad with good width to the muzzle. Eyes to be large, bold and bright. Ears to be large rose petal shaped, drooping and set with good width between. BODY: To be firm, fit and of a good size appropriate to age. Of course coat type and colour will affect the standard depending on the breed of cavy you own. Cavies are for life, therefore if you think you're ready to own a cavy, consider that they live about 4-6 years (sometimes up to 8 yrs.) and need proper care, housing, love and attention. After taking all that into consideration, if you would like to buy one of my beauties, then contact me. If I don't have one available, then I can put you on my waiting list. Cavies are loving, mellow little creatures that are very docile and will make fun squeels when they see you or are hungry and thirsty. They make wonderful pets. ** Please note that I do not run a cavy mill and now own a very small number of cavies. Averaging approx. 3-4 litters a year only. Cavies are pregnant for two and a half months and once babies are born, another 4 weeks must go by before they are weaned. Therefore it may take some time for you to get your special pet, but it is deffinitely worth the wait! "Click below to vote for my website"